When Occupy Design UK put out a call last week for Crisis Graphics in protest against climate change I immediately knew what I was going to submit—a reworked version of my 2002 piece Pear Shaped. Originally created for a People Tree design competition, for which it won an award, I was never really happy with the typography. Occupy Design’s call gave me the opportunity to rework it, channelling a typographic treatment I liked in a piece of work by Ivan Chermayeff that I first saw at his Cut and Paste retrospective last year, (see Holiday exhibitioning pt 1). I’m not usually one for returning to my past creations but Pear Shaped suited the cause and recycling an old idea seemed appropriate. It is, however, an inditement of the lack of progress on climate change that an image created 13 years ago is still relevant today. 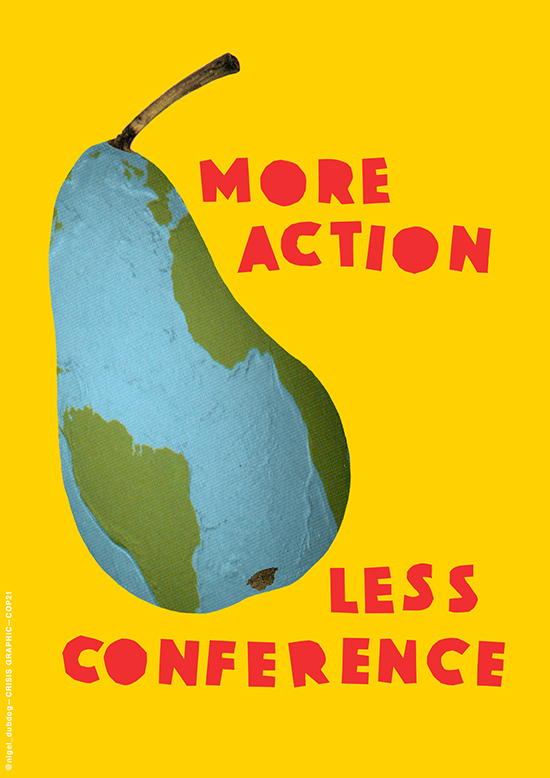 Occupy Design UK’s aim is to create an ‘Agit-Prop Army’ of images for the Time to Act on Climate Change protest in London on 7 March 2015. Time to Act’s intention is to put pressure on political parties to consider the environment in the run-up to the general election in the UK in May, with a further aim to build towards the COP21 UN Climate Summit being held in Paris in December. Occupy Design UK’s call for Crisis Graphics.